A collaborative research team based in Japan has designed new proteins that can self-assemble into the complex structures underlying biological organisms, laying the groundwork for leading-edge applications in biotechnology. The researchers created and developed the proteins with a specific function, and their method reveals a possibility that certain protein functions can be created on demand. "All organisms contain self-assembling biomolecules including proteins, nucleic acids, sugars, and lipids," wrote Ryoichi Arai in the paper. Arai is the head of the department of supramolecular complexes in the Research Center for Fungal and Microbial Dynamism at Shinshu University in Japan. "The ability to design and control such assemblies is a central goal of biomolecular engineering, nanobiotechnology, and synthetic biology." Arai and his team developed a simple and stable artificial protein, called WA20, in 2012. By 2015, the researchers progressed to protein nanobuilding blocks (PN-Blocks), which use WA20 to self-assemble into multiple nanostructures. The researchers built on that success to develop extender PN-Blocks, which link WA20 proteins together to produce chain-like protein complexes and even more nanostructures. 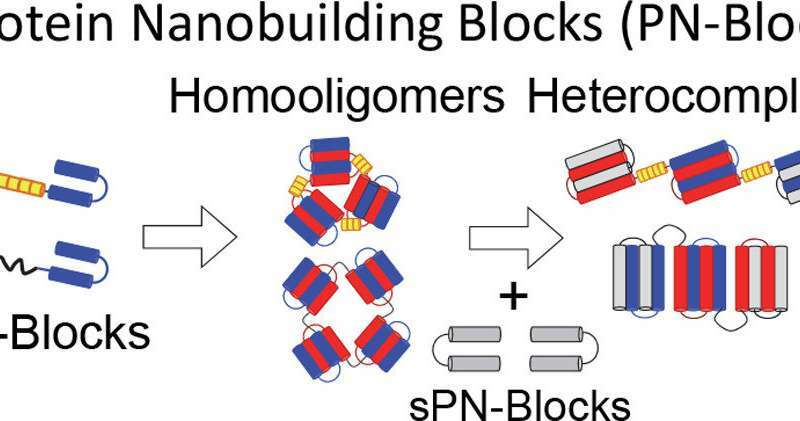 "The design and construction of self-assembling PN-Blocks is a useful strategy—they're like LEGO blocks," Arai said, referring to the plastic toy blocks that can be built into vastly different structures despite how little they individually vary. The scientists linked two WA20 proteins in tandem (ePN-Block), creating oligomeric structures. Another PN-Block (sPN-Block) intervened, affecting the structures to be different, varied chain-like complexes on demand. The supramolecular nanostructure complexes were achieved by introducing a metal ion, which triggered the process through further self-assembly. The researchers plan to create a variety of stable and functional complex nanostructures through the combination of PN-Blocks. The potential of PN-Blocks has been increased even more now that more complexes can evolve with the help of metal ions. The next step is further developing nanostructures to contribute to the development of nanobiomaterials, which could be used as a drug delivery system or to create useful proteins for bio-pharmaceutical investigation, such as artificial vaccines, in an environmentally friendly way.